Worlds of Imagination & Adventure Await You! Important Edition Notes: This edition replaces the settings from the original True20 Adventure Roleplaying with the entire contents of the True20 Companion, providing you with a one-stop True20 rules compendium. As well, True20 Revised Edition includes all known errata fixes and some rules clarifications. With True20 Adventure Roleplaying you embark on journeys of the imagination, with heroes and stories you and your friends create. This book tells you everything you need to know to play an exciting adventure roleplaying game: how to create your own heroes, how to handle action and conflict, how to narrate adventures, and how to keep it all fair and fun. 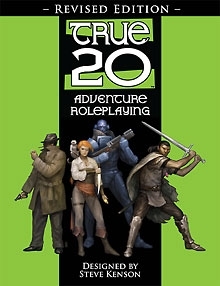 True20 simplifies and streamlines the adventure roleplaying experience: everything is resolved using the same core system and all you need is a single 20-sided die to play! There's no bookkeeping of points, whether hit points, power points, or experience points. Game play is fast and furious thanks to innovations like the Toughness save damage system, based on the award-winning Mutants & Masterminds RPG. You can use True20 to model nearly any genre, from fantasy and horror to modern action and science fiction. Role Creation: Build your own heroic roles for True20, or just modify the roles of adept, expert, and warrior to suit the style of game you want to run. With the easy-to-use system you can create any heroic role you want, or even eliminate roles altogether, making each character's progression unique! Genre Development: The Revised Edition also presents information on four popular genres of roleplaying: fantasy, science fiction, horror, and modern action, with guidelines, suggestions, and optional rules for using True20 Adventure Roleplaying to create heroes and tell stories in those genres. All this and more awaits you. If you want a fast, simple, and fun game system that's still familiar to players of the world's most popular RPGs, if you want a vehicle for traveling to new worlds of adventure, then True20 is for you! This title was added to our catalog on April 15, 2008.